The LA Valiant Plays for St. Jude program is a first-of-a-kind partnership that unites an esports organization and a nonprofit. Immortals, and its Overwatch League® franchise team—the Los Angeles Valiant— teamed with St. Jude Children’s Research Hospital and Pledge It to create a unique digital fundraising activation in esports. Through the program, fans can donate based on the outcomes and achievements of the LA Valiant team and players during the Overwatch League season. All proceeds will support the St. Jude mission: Finding cures. Saving children®. The LA Valiant is one of the top esports teams in the Overwatch League and, just like traditional sports, Valiant fans are rabid followers of their favorite team and players (gamers). 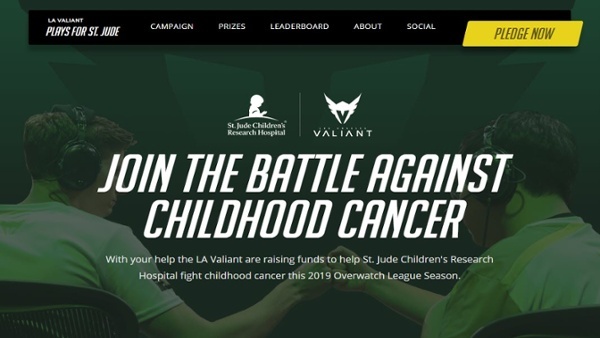 The LA Valiant Plays for St. Jude program is designed to engage fans, inspire action, create intrigue and magnify the excitement of the game while giving back to a worthy cause. “It is part of our organizational DNA to give back to the communities that we serve and represent,” says Noah Whinston, Executive Chairman of Immortals and Los Angeles Valiant. View the LA Valiant Plays for St. Jude Program. Fans earn badges for each pledge they make and receive recognition on the community leaderboard. Any fan who donates $100 or more earns an exclusive LA Valiant Plays for St. Jude T-shirt. And the community activation includes LA Valiant fans voting for the rewards they’d like to see when the program surpassess specific fundraising milestones. Popular rewards include smashing a pie in the face of their favorite Valiant player and exclusive online coaching sessions with the top Valiant players. -Richard Shadyac Jr., President and CEO of ALSAC, the fundraising and awareness organization for St. Jude Children’s Research Hospital.